By Train: The church is a short 1/4 mile walk from the South Acton Commuter Rail Station. 1. Follow Route 27 South through Acton Center and the intersection with Route 111 to the next traffic light in South Acton. 2. At the light, turn Left onto School Street. 3. South Acton Congregational Church is located on the Right just before River Street branches right. 1. Follow Route 27 North through Maynard to the first traffic light in South Acton. 2. At the light, turn Right onto School Street. 1. Take Route 2 West beyond the rotary in West Concord to Acton. 2. Immediately following the next traffic light, take the Left exit onto Route 111 West. 3. At the next traffic light, turn Left onto Route 27 South going towards Maynard. 4. At the next traffic light, turn left onto School Street in South Acton. 5. South Acton Congregational Church is located on the Right just before River Street branches right. 1. Take Route 2 East to Exit 42 in Acton. 2. At the end of the exit ramp, turn Right onto Route 27 South going towards Maynard. 3. At the second traffic light, turn left onto School Street in South Acton. 4. South Acton Congregational Church is located on the Right just before River Street branches right. The School Street Lot is located on the south side of School Street between the intersection with Route 27 and the church. The Great Hill Lot is located behind the fire station on the north side of School Street. When coming from Route 27, look for the driveway on the left immediately following the station. 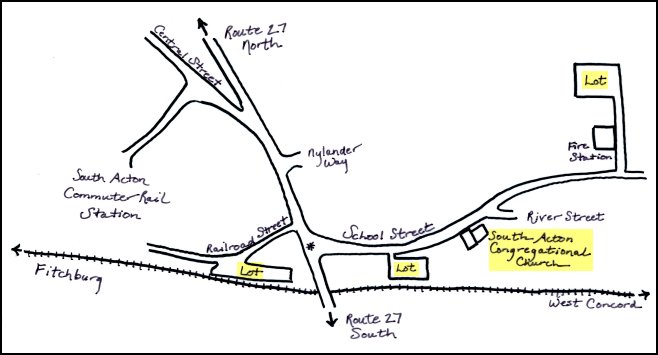 The Railroad Street Lot is located just off of Route 27 in South Acton. When traveling south on Route 27, turn Right at the traffic light just beyond Jones Tavern. When traveling north on Route 27, turn Left at the traffic light just before Jones Tavern. Use the traffic light and pedestrian walkway to cross Route 27 and reach School Street.